This item is available in 655 cover options. Click to view options now! Your living room is your sanctuary, its important that it makes you feel relaxed, happy, and snug as a bug. Choose this armchair for the perfect blend of incredible comfort and enviable fashion. 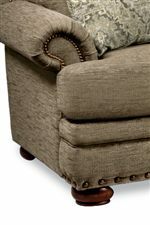 The pristinely tailored chair features traditional decor features like rolled arms and two sizes of ornate nailhead studs for an unforgettable look. The BRENNAN Traditional Chair with Comfort Core Cushion and Two Sizes of Nailhead by La-Z-Boy at Jordan's Home Furnishings in the New Minas, Halifax, and Canning, Nova Scotia area. Product availability may vary. Contact us for the most current availability on this product. Fabric Options Available in fabric and leather, with Performance options that features protective coatings and surface techniques (like embossing) for each. For a sophisticated and immaculately tailored living room set, Brennan exudes classic charm from every angle. Brennan features a traditional rolled arm silhouette that's been dressed up with wooden bun feet, two sizes of nailhead studs, and cozy toss pillows. Built to last, this group includes our exceptionally durable and soft Premier ComfortCore cushions. This construction features zoned cushion technology, with different densities of foam in different areas of the cushion to relieve pressure behind the knees and prevent the back of the cushion from sagging with use. For classic style that pleases modern sensibilities, choose the Brennan sofa, chair, loveseat or ottoman. The BRENNAN collection is a great option if you are looking for Traditional furniture in the New Minas, Halifax, and Canning, Nova Scotia area. Browse other items in the BRENNAN collection from Jordan's Home Furnishings in the New Minas, Halifax, and Canning, Nova Scotia area.